TEMECULA, CA – December 21, 2018 – Habitat for Humanity Inland Valley’s 12th annual Christmas Tree Lane was, once again, a wonderful experience for everyone that visited the display and helped raise funds for the organization. Christmas Tree Lane 2018 will be celebrated as the organization’s most successful display so far, raising $29,000 for the organizations home building and repair projects throughout the Inland Empire region. 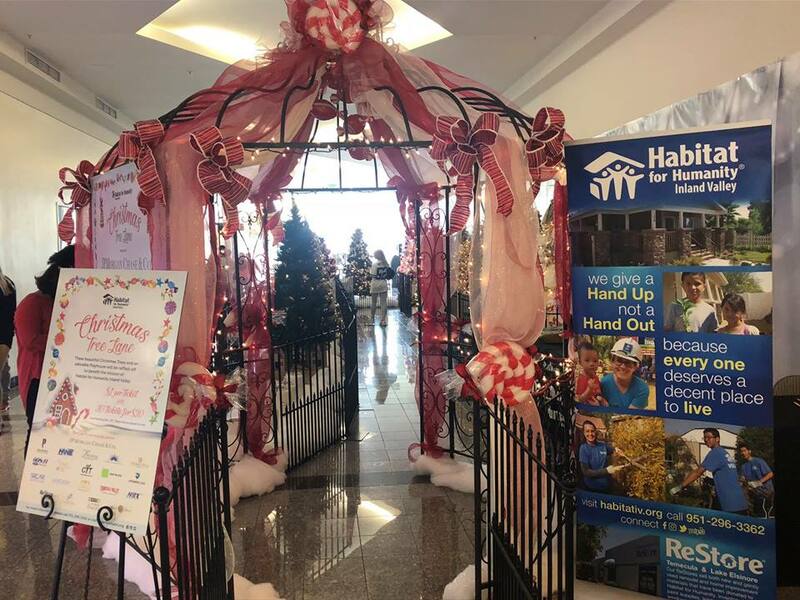 The event featured 20 designer-decorated trees and a full-size playhouse on display at Promenade Temecula from November 4th – December 16th. he Christmas Tree Lane committee was led by Jackie Steed, of Reliable Realty, who worked closely with the Habitat staff and designers to create 19 beautiful trees sponsored by local businesses. The display title sponsor was JP Morgan Chase & Company, and Pacific Western Bank sponsored the life-size playhouse. Christmas tree sponsors included: Rancho Dental, SRCAR, Langdon Flooring, Gosch Auto, Lilium Lee, JP Morgan Chase & Company, Reliable Realty, Pechanga Resort & Casino, Living Spaces, Mission Increase Inland Valley, Paradise Chevrolet Cadillac GMC, Christian Youth Theatre, Hine Mazda Subaru, JPower Group, HBX, LLC, Temecula Valley Toyota Scion and Temecula Creek Inn. “We are so excited about the success of this year’s Christmas Tree Lane. It is one of our largest fund-raisers for the year and this one was the best yet! We are especially thankful for the support of our sponsors, designers, staff, and volunteers. The team worked so hard to make the display extremely beautiful, and we couldn’t have had this success without them,” said Tammy Marine, Executive Director of Habitat for Humanity Inland Valley. The 19 Christmas trees were created by talented designers who transformed each tree into a magical Christmas experience. Designers included Bev Rudde, Patti Utke, Jennifer Lloyd and Amy Sullivan with Christian Youth Theatre and Wille and Sandy with Lilium Lee. The display was a labor of love for many loyal Habitat volunteers who love giving of their time during the holiday season. Additional volunteers who helped set up, staff ticket sales, and break down the display were from HR Block, Chaparral High School and Great Oak High School. We want to give a big thank you to all our loyal Habitat volunteers, the talented tree designers, and all the businesses and student volunteers who helped make this event possible. It takes hours to set up, manage and breakdown this incredible Christmas experience and we appreciate everyone who came out to help make a magical Christmas experience a reality,” said Elizabeth Hamerschlag, Special Events & Marketing Director, Habitat for Humanity Inland Valley. In 1991, Habitat for Humanity Inland Valley (HFHIV) was founded as an affiliate of Habitat for Humanity International. Using faith-based principles as it’s foundation, the organization exists to provide low income housing, home repair and home preservation services for families in the Inland Valley region. Habitat for Humanity Inland Valley is dedicated to eliminating substandard housing locally, as well as globally, through constructing, rehabilitating and preserving homes; by advocating for fair and just housing policies; and by providing training and access to resources to help families improve their housing conditions.